Christmas is getting closer. Are you ready? Personalized Creations is having a big Christmas Sale on the entire store with 10% off everything. The 10% off will show at check out. You must check out the sale before December 15th for Christmas delivery. Our new monogrammed design Christmas Bows are a big hit this season with designs of a wreath, Christmas Tree, Snowflake, Candy Cane, Present and Santa Hat. These designs are all embroidered on the ribbon for a lasting design. We also have wonderful organza bows for those special dressy times during the holidays. 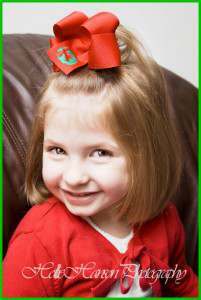 Don’t let your little princess go without her special Christmas bow today. We also have a wonderful line of baby gift items to choose from.